You've see it in the movies: rowdy college parties with the red cups and beer flowing freely from one or more kegs. There are disheveled people yelling 'chug chug chug' while someone is hoisted up by their legs to gulp from the tap. A recent party I hosted didn't involve keg stands, but it did involve copious amounts of beer and my roommates and I were thinking big when we decided to provide and tap our very own keg for our guests pleasure. Since we were all being forced to move out of our beloved inner-city Queenslander, we decided to have one last hurrah and host the kind of party that people would want to come to and would be talking about for years later. Solution: provide the beer and lots of it. Now you might be thinking 'yeah and it probably cost a fortune' but I'm happy to report it was a more than affordable exercise. We had however originally contacted pubs and other licensed venues and were quoted over $400 for a keg of brand name beer which did not include a deposit. This was beyond our budget so it came to check out the next solution: BRU 4 U. Located on Zillmere Road in Boondal, BRU 4 U brews over 200 varieties of beer including lagers, stouts, ales and draughts and has styles replicating local and international favourites including Corona, Toohey's Old and Heineken. We settled on a 50 litre keg of lager resembling Toohey's Extra-Dry which we though was most likely to be a crowd pleaser. Since the beer needs 2-4 weeks to brew we placed our order and paid a 100 dollar deposit upon ordering. We would pay the other 140 dollars on pick-up day roughly two weeks later. Divided by four of us the total cost didn't feel like too much of an expense at all and our order also included use and hire of the keg and a keg fridge with tap for easy pouring and minimal wastage. On pickup day owner Ron provided us all with a schooner and we were given a taste testing our our home-brewed lager. I was overjoyed to discover that I liked the taste of the beer more than my commonly consumed Toohey's Extra Dry. It tasted more crisp and Ron informed it had none of the preservatives of name brand commercial beer. This later proved to be excellent news in minimising the hangovers the next day. Setting up the keg proved to be relatively hassle free which was welcomed freely since we'd been running around all morning getting everything ready for the party and didn't fancy any complications. Now it was time to relax with a beer and wait for people to arrive. We had scheduled the party to be an afternoon/evening affair as to not offend the neighbours any more than necessary. We tapped the keg at 3 o'clock just before the first guests arrived congratulating ourselves on a set up well done. Since we were expecting around 50 guests we thought it wise to make it an outdoor party with bamboo citronella torches (available from Bunnings for $4 each) to provide some extra light. American-style red beer cups were also in abundance at our party and are available from Dan Murphy's, BWS and Woolworth's Liquor for $3.99 for a pack of 25) With the red cups we had a few rounds of beer pong going on as a bit of competitive entertainment throughout the party - See here for rules. We also figured a beer is no good without beef, and so had a BBQ cranking through the night which proved quite popular as the evening wore on and people became disoriented and ravenous. The keg finally ran out just before 9pm which was a blessing in disguise as it helped to disperse some of the crowd since it was getting late and we were expecting a polite visit from the police from then onwards. It amazed all of us how much beer a single keg yields with so many people drinking from it. 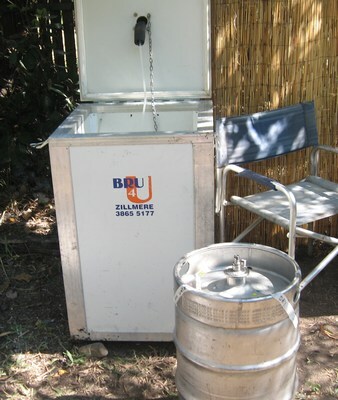 If you are looking to host a keg party of your own or for any other function whether it be a wedding or bucks night BRU 4 U are an affordable and professional solution when providing a beer and keg. It goes without saying that the keg and vast quantity of beer were the key feature of the party and along with everything else helped make it a complete success.